Karen Moore is no stranger to Dalhousie Athletics. Behind the office chair of the school’s newly-minted Director, Varsity Athletics, are three photos of what is undoubtedly among Moore’s most cherished memories: her 1982 women’s volleyball national championship. One image shows her Tigers of yesteryear celebrating their national win at a packed Dalplex. Moore, tucked away to the side, almost isn’t visible in the shot, yet she still prominently displays the photo in her office. Moore hopes other Tigers athletes will have as fond memories of their time at university as she did. Moore now has more power to make that happen, replacing the resigned John MacDonald Jan. 23 as head honcho of the varsity portfolio. 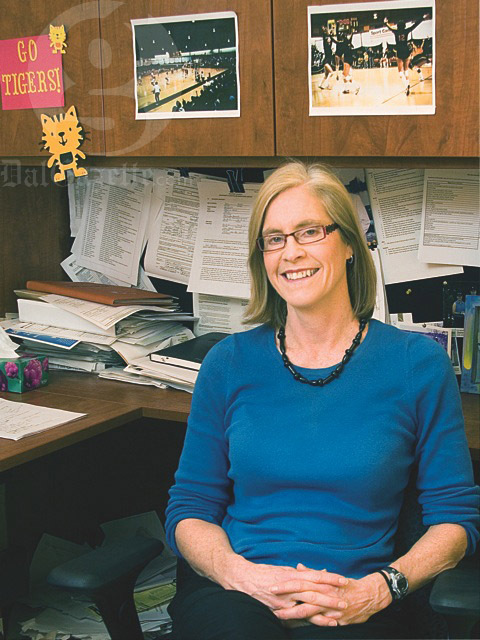 She previously worked in a similar capacity as the school’s associate director of athletics since 1990. The two-time Nova Scotia Sport Hall of Fame inductee sat down with the Gazette during her first week on the job. Dal Gazette: Let’s take a look back, shall we? We’re just past the midway point of the season. What are some highlights for you of the Tigers season so far? Karen Moore: I think the fact the women’s soccer team, being as young as they were, were able to win that championship was a huge deal. That was probably the highlight. Now, obviously, we had a cross-country championship as well and they did an incredible job, too, but I think the women’s soccer championship was one of those wins that was kind of unexpected. DG: They certainly peaked at the right time. Very good. Alright, you seem to be experienced for this job. [You are] a former Tigers athlete, coach and an Olympian as well. How do you think that experience will play into this job? KM: I think, for sure, having been there as a student-athlete, I know how they think a little bit. Obviously, there’s a huge generational gap now, but I have been in touch with the students all along in the last, what, 29years I’ve been at Dal. I’ve coached for awhile, too, so I have seen a change in the way students work and think, but, in a way, having been there as a student-athlete I know what they want, what they like and what they’re looking for. As a coach, I know what the coaches need, and that experience of having worked with varsity programs for years and knowing how the university works, I think all of that plays into my role and my transition into the next level, which will be a lot of long-term thinking and always trying to make improvements in the program. DG: You certainly see a big importance in athletics. What do you see as the value of athletics within universities in general? KM: I think it’s very important. We would really like to make a bigger difference in terms of school spirit. There’s a lot of work that needs to be done in that light. I understand that students are incredibly busy themselves. They’re either working or they’re involved in a lot of activities besides just academics. So, what we would love to create is an atmosphere where students want to come and be a part [of athletics] because it’s an exciting event—that we could be one of the contributors to the student life experience. That is something that we’re going to have to put further work into. We’ve noticed in the last number of years, in some events more than others, that our basketball crowds have really improved in the last couple of years. And part of that is because our men’s team has won two of the past three championships, but our women’s team is also becoming very exciting. We get almost as many fans for the women’s games as we’re getting for the men’s now. The school spirit indeed is something that we would like to be more a part of. DG: You’ve mentioned some of the challenges you see in this job. Where do you see Dal Athletics in five years? KM: We have, in the last year and a half, two years, been working on what we’re calling a varsity review. We’re reviewing all aspects of our programs. We’ve engaged a number of different shareholders from various areas from within and external to the university. Coaches did presentations so that everybody on that group got a sense of where we are and where we would like to go. Ultimately, I think varsity sport is about elite sport. It’s not about participation. And one of our biggest challenges has been, obviously, that our budgets haven’t grown in forever. The university funding has been level for some years, and it’s been a challenge for coaches to maintain a competitive status in the leagues because in order to recruit the best athletes you have to have the resources to attract them. We would love to see a situation down the road where fundraising wouldn’t be so necessary. We’d have to seek out alternative sources of revenue and wherever we have to streamline some of the things we’re doing, we have to look at it all. DG: Is there ever a possibility that we get rid of a team? KM: Well, that would be heartbreaking for me because obviously I’ve been here for almost 30 years, and I would hate for that to be my legacy. I would really like to see us develop our sports into a very high level, always competitive. Right now our strategic plan says we want to be top three in our conference at all times. We want to be competitive nationally in all our sports, and, in order to do that, you need to provide the resources to be competitive. I can’t tell you right now we’re going to have 14 programs in five years because that’s not all within my control. But that, to me, would be a last resort, cutting programs. Because to me, that’s like giving up. But we may be faced with that down the road. DG: Going back to school spirit and getting students in the door, everyone knows student support needs to be better. I guess, what’s that hurdle? KM: I think we’ve probably got to get some feedback from students. I think our marketing department is working on that. They’ve been trying to get in and work with residence people and the student union, and I think there are some bridges being built there. But I think, as you say, there are hurdles to jump over. We’ve got to get into the students’ heads and find out what they want and what they’re looking for, and if we can provide that, great. Right now, I don’t disagree with you. Our audience right now is more family-oriented, more alumni and more community. We have definitely been trying to focus on students in the last couple of yrs and it’s been a challenge for sure. So, if you have any great suggestions, hey? We’re listening. DG: Good answers. Thank you for your time.